Some rubber ducts may be secured to the ground or counter surfaces with double-sided tape. They are flame and abrasion resistant. Constructed to withstand heavy traffic and office wear and tear. At construction sites and other unconventional work environments, large cables, pipes, wires are often stretched across a work site to transport electricity, electronic data, water or compressed air. In such cases, many problems can occur. Continual foot or vehicle traffic can disrupt or even permanently damage the cables. 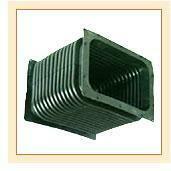 Hence rubber ducts are highly popular and demanded for various applications. They are used in light vehicular applications. They are great for low light situations where lighting effects are a must. They are used by electrical contractors and distributors, electricians, and are used in environments such as carnivals, sporting events, and offices. Anywhere there is a generator, appliances, or just cables/wire on the floor, there is a need for a cord cover or rubber duct.